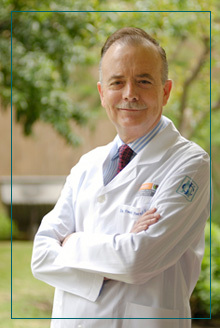 A Mexico City doctor and researcher, Dr. Manuel Martinez-Lavin, has been studying and treating people with Fibromyalgia for over thirty years. In a 2009 paper he proposed two pathways for Fibromyalgia. One suggested that over-activation of the sympathetic nervous system fibers (sprouting) left nerve cell bodies called the dorsal root ganglia (DRG) in a hyperexcitable state. The last way stations for sensory input from the body before it reaches the spinal cord, Martinez-Lavin believes these nerve bodies are overloading the spinal cord with pain signals. He also proposed that increased activity of the sodium channels that transmit pain signals in the DRG could be present. His proposal that infections could be driving the hyperexcitability found in the dorsal root ganglia/sodium channels is reminiscent of Van Elzakker’s theory that a hidden infection may be doing the same in the vagus nerve. Over the past ten years Martinez-Lavin has been validating the role of the autonomic nervous system in Fibromyalgia in much the same way Dr. Newton has in ME/CFS. His research has revealed similar autonomic issues including a hyperactive or over-responsive stress response system that paradoxically ‘folds’ under stress. A 2014 meta-analysis of 196 papers concluded that sympathetic dominance is common in FM, ME/CFS, IBS, and interstitial cystitis. Martinez-Lavin believes that ‘relentless’ sympathetic nervous system activity could explain many of the symptoms present in FM (and other disorders) including chronic pain, sleep problems, anxiety, dry mouth, gut issues, and problems standing. We will get to more of Dr. Martinez-Lavin’s work later, but for now we turn to his book, “How Stress Becomes Real Pain”, which he wrote for patients and doctors explaining his view of FM and how he treats it. We’ll be highlighting sections of the book in a series of blogs. I will be adding my thoughts, as usual. Thirty years ago Dr. Martinez-Lavin believed Fibromyalgia might be due to a “drastic breakdown” of that portion of the stress response system called the autonomic nervous system, but it was not until advanced computational algorithms were developed that were able to track heart rate variability that a window into the dysfunction was opened. In the meantime (and still today) Martinez-Lavin believes that a misunderstanding of Fibromyalgia has led to massive ill-treatment of the disorder. FM may be misunderstood, but Martinez-Lavin notes that it’s very common (2-5% of the population) and 80% of the sufferers are women. For a disorder that, like Chronic Fatigue Syndrome (ME/CFS), gets pitiful funding from the National Institutes of Health, FM has been around for quite a while. A syndrome characterized by widespread muscular pain and hypersensitivity at certain points (“tender points”), FM was called “fibrositis” (swelling of the fibrous tissues) in the early 1900s. The inability to find evidence of inflammation in the affected muscles and points, however, left researchers floundering, and the term “psychogenic rheumatism” began to be employed by some. By the 1970s the name “fibrositis” had been replaced by “fibromyalgia” – a term that simply evoked the presence of muscle pain. Research languished until a seminal paper in 1990 suggested a definition (widespread muscle pain, the presence of tender points) that brought coherence to the field. That study made it clear that, just as fatigue hardly defines ME/CFS, pain does not in any way define FM. Other common symptoms include fatigue that does not improve with rest, disrupted sleeping, diffuse morning stiffness, tingling sensations, numbness and cramps in the arms and legs, headaches, IBS and anxiety or depression. All these symptoms are much more common in FM than in other rheumatological disorders (disorders of the muscles and joints). Pain occurs when an injury to some part of our body sends pain signals coursing through our nerves to the spinal cord, which then sends them on to the brain. Just before the pain signals get to the spinal cord, though, they’re collected in ‘way stations’ called the dorsal root ganglia (DRG) that emanate from the trunk of spinal cord. The DRG process and modulate the pain signals and send them onto the spinal cord and the brain. Martinez-Lavin notes that an important amount of pain modulation also occurs inside the brain in the hypothalamus and thalamus. Both activate the autonomic nervous system (ANS) – a key player in Martinez-Lavin’s conception of chronic pain – when confronted with pain signals. Ultimately the pain signals reach the cortex of the brain, which translates them into pain sensations and sends us into an immediate search for get rid of the pain. That quick prompt to get rid of the pain — to resolve whatever injury has occurred — means that acute pain is a very effective and useful tool for maintaining our health. Chronic pain is different. It doesn’t lead us to resolution of illness, and the changes that occur and the stress it invokes cause it to become pathogenic. Instead of helping us to resolve a disease or problem, it causes disease. Fibromyalgia, to Dr. Martinez-Lavin, is nothing less than pain turned into disease. 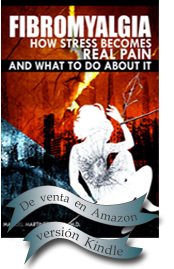 Martinez-Lavin divides chronic pain into two types: nociceptive pain and neuropathic pain. Nociceptive pain occurs when an unresolved injury prompts an inflammatory response at the site of the injury. The inflammation associated with arthritis or cancer, for instance, damages the tissues, sending pain signals to the brain. Neuropathic pain occurs when the irritable or hypexcitable nerve fibers constantly send pain messages to the brain. That hyperexcitability gets put into play, Martinez-Lavin believes, at the dorsal root ganglia. Windup causes neurons in the spinal cord to transmit pain signals to the brain – in the absence of painful stimuli. Inside the spinal cord another source of pain intensification called “wind-up” lurks. Once again irritable and hyperexcitable nerve fibers are featured, but because they’re actually in the spinal cord the increased pain sensitization is referred to differently: it’s called ‘central sensitization’. If you were to apply heat to your hand every couple of minutes you should experience heat in your hand — every couple of minutes. Wind-up, which usually occurs in response to neuropathic ( but not nociceptive) pain, causes the pain to linger for longer periods of time. As wind-up progresses the pain will remain even when the heat is not present. The nerves in the spinal cord can become so ‘wound-up’ or excitable they can begin to react to any stimulation — such as clothes touching the skin — as painful. These hyperexcitable spinal cord nerves secrete a variety of pain producing substances such as substance P, glutamate and aspartate. (This is where the microglia come into play.) As this stream of pain signals waft down the calcium channels, these channels can become hyperactive as well. Meanwhile the levels of the substances that inhibit pain, such as adenosine and GABA, drop. Now you have hyperexcitable nerves sending pain signals down hyperexcitable calcium channels and nothing to turn them off. Martinez-Lavin believes the SNS is behind all of this. During times of acute stress the SNS secretes substances such as epinephrine that turn off the nerves that relay pain. Pain sensations are diminished during times of danger to allow you to focus on the danger, not on your body . 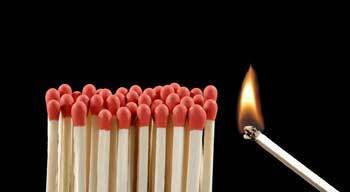 When stress becomes chronic (as occurs during chronic pain) Martinez-Lavin reports that instead of turning off the nerves that relay pain, epinephrine actually turns them on. It also causes the sympathetic nerve fibers in the dorsal ganglia to sprout or grow. That sets up a positive feedback loop, with the SNS becoming more active thus causing more pain and thus more stress which causes more nerve sprouting, and so on ad infinitum. The stage has been set for an unrelenting state of pain. The stage has also been set for stress to cause not just emotional upset but real physical pain. In Martinez-Lavin’s model, chronic stress turns on pain-producing nerves in the dorsal ganglia. Then it hypersensitizes them by sprouting or growing, thereby sending them a steady dose of epinephrine. Why the dorsal root ganglia end up botching their pain modulation job up so thoroughly in some people is not clear, but Martinez-Lavin ends the chapter noting that infectious agents – which are able to find shelter from the immune system in them – are a prime suspect. I do agree when I am stressed my pain levels do increase and when I go through surgeries, sickness or physical traumas or an emotional trauma I have a fibromyalgia backlash that can last for weeks to years. I notice pain is increased by stress too – but not much. For me the biggest thing I have found that affects pain is food. U can’t eat any grains – rice will cause severe back pain within 2 hours and this takes days to go eventually passing down through my hops then knees which I can’t bend. Also dairy and eggs are culprits as well as other foods. I’ve noticed that all the foods that affect me have a high calcium content – anyone else notice this? that’s a great observation. Wheat, dairy and eggs make me more fatigued and/or bloated although removing them doesn’t return me to health. I don’t know about calcium but those are all common allergens. My relapses have been caused by bereavements but I didn’t notice other stress affecting me until my ME got severe. If I get a shock I also immediately get a prickly/itchy sensation over my chest and under my arms. However hormonal and weather changes also affect me. I wonder in relation to the following :’they can begin to react to any stimulation — such as clothes touching the skin — as painful’. I experience this so I might go past the sofa but the pain from brushing across it is way disproportionate . But the other thing I get which im not sure Dr Lavin covered is easier bruising that can take much longer to heal.Once I got a bruise that took one whole year to disappear and after a few months it would disappear only to reappear and so on- it was quite bizarre. Does Dr Lavin’s theory have any explanation for easier bruising and problems with the healing mechanism? Haven’t seen anything about bruising. We’ll see as the book goes on. I also experience sensitivities to being touched and bruising appearing out of the blue which makes me think it was caused by something I didn’t notice occurring. Something that wouldn’t have alerted me to expect bruising. It also takes a much longer time for any bruising to disappear than it did when I was younger – I can’t say it is related but it’s a possibility in my mind. This shows an important distinction: stress did not cause the FM or ME but once the infectious agent takes hold of the immune system and/or the nervous system, stress exacerbates these illnesses and then becomes self-perpetuating. Autopsies of Sophie Mizra and another young woman, ME patient, whose name I can’t recall (committed suicide because of the unrelenting pain) showed dorsal root ganglia growth in abnormal knots. Thanks for bringing this book and this researcher to my attention. This is worth pursuing. Thanks for noting that about dorsal root ganglia and Sophia. I didn’t know that was where the found the problems. I would agree with your first statement until I was blue in the face. An inordinate response to stress has been a key feature of my ME/CFS/FM since it started. It was not there before! Stress whether physical or emotional is like poison to my body. Even though I taught and practiced stress reduction techniques in my former life, the utter colaps into regional pain syndrome is almost instantly with no time fo intervention. My recovery period from stress response takes longer than PEM. Im wondering if anyone else has this response? I call my stress response broken beyond repair. I still use the techniques, many of which have been recently discussed in these blog reports, but at the moment of battle, the response is immediate and causes tremrndous havoc. Any sort of emotional, physical and even mental stress will shut me down like my mind can’t go. Whether its a family member or complete stranger comes at me with attitude or accusing me of something, my mind shuts off and my body follows. It takes a while to recover if I ever really do. The pain that follows is so hard and the fatigue is horrible. Any physical act from drying off from bathing to grocery shopping is exhausting. And mentally…my decision making process takes forever it seems. I’ve become unable to make quick decisions. Thankfully I can still drive and haven’t had any accidents. So glad I came across this information and hope more will come. Lynda….your experience shows a) what a battle we have and b) the enormous changes that have taken place in our bodies. It reminds me of Toni Bernhardts difficulty with meditation after she got ill despite her years of experience meditating at a pretty high levels. My experience – from a much humbler level – is similar. It begs the question – what happens to people with this disorder to cause something like this? I had had ME for 41 years before my neuropathic pain started (on the back of severe allergy and a viral assault during 2011). If ‘stress’ includes those sort of ‘stressors’ then yes, they are associated with pain. If ’emotional stress’ is the issue then it has zero bearing on my pain at all. Stress is the no.1 factor and it is the worse in Systemic Mastosytosis/Mast Cell Activation Disorders. Cytokines/Histamines are major factors involved and avoidance of Histamine foods is crucial…The majority of people say the medicines don’t work but diet is the best way. Thanks – I plan to cover those in a blog at some point. There must be some link between the SNS or HPA axis that causes stress to have such an impact in those disorders. 2 years ago I was diagnosed with Fibromyalgia. I believe stress can cause pain & discomfort, but I question how much does stress play in its role with Fibromyalgia. I am a 54 year old woman & I have had many episodes of severe stress in my life, but didn’t suffer with muscle , nerve, bones pain like I do now with fibromyalgia. I just feel, it needs to be said that the focus shouldn’t just be on stress. Something else is going on internally in our bodies, and due to all the symptoms that come with Fibromyalgia, ironically these symptoms cause some stress just dealing with them. I’ve had CFS for 20 years with occasional bouts of FM. Toward the end of 2013, over the span of 2-3 months, not only did the fatigue become significantly more severe but the FM kicked into high gear and has been a problem ever since. I finally realized this coincided with menopause! It was almost a exactly a year following my final period when the symptoms began emerging with such ferocity. I started hormones in February of this year and I am better but the FM flare ups are still pretty bad. I read somewhere about the COMT gene (can’t remember what it stands for) having a role in CFS/FM and that the gene was estrogen sensitive. This along with an 80% rate of sufferers being women certainly seems significant. Given the female predominance in ME/CFS and FM I think the hormone-immune connection has to be a major player. The folks at Dr. Klimas’ Nova Southeastern University institute are working on it. I have a lot of stress, but I got fibromyalgia symptoms two years before my diagnose premature menopause. Definitely hormone related!!! I don’t have a diagnose fibromyalgia because it is the same for me as changing/fluctuating hormones. It has a huge negative impact on my life because no I have two things. I must rebuild my own life without children, no study, financial problems and a premature menopause at age 35 that is causing me severe symptoms for the last 6 years!! All the fibromyalgia symptoms you can Link with estrogen. The headaches, TMJ, digestive problems, pain threshold, fatigue, sleep, symptoms that come and go (fluctuating), visual disturbances, dry eyes, inflammation, hot/cold, pins/needles, tiredness attacks…… All hormone related symptoms!!! I now have a problem because most doctors see it as a psychosomatic disease and they have no idea about women problems. It is truly sad because it can ruining your life. And if life was already difficult ( who has not a difficult life) than you cannot handle this on top of it!! I notice increased fibro pain a day after initial stress is felt/delt with…then the next few days are PAY days. It gets old after 26 yrs! I was diagnosed in 2007 following diagnosis with Hashimotos, where I had two radioactive iodine uptake scans. I had a hysterectomy and was wiped out. I had to leave a career in health, but tried to go back to work three miserable years because neither myself nor my family could face disability. I eventually did get better somewhat after about seven years. In 2016, I was in hospital with very high ESR and CRP as well as infection with pericarditis and pluerrl effusions. I am still very ill with most days having only a couple hours with ability to function. I am finding the article about medications used in treatment helpful. I have a lot of stress but it doen’t affect my symptoms. Wat has an effect on my symptoms are hormones, premature menopause!